The location is great for its views especially the sunset. The staff was exceptionally helpful! Large breakfast buffet was delicious. The cave rooms were clean, comfortable beds and great shower. I would definitely stay here again. The staff was very accommodating and the property was in a great location to see the famous sunset! The mattress was very comfortable and the property was clean and quiet. Chef was amazing and very helpful every morning especially with my daughter’s allergies. Staff were very helpful and hard working. Porters were extremely helpful with the luggage. Transfer to/ from port and airport were luxurious. Excellent experience overall will definitely recommend and hope to stay again. Large rooms, and beautiful setting. They had limited food options at the hotel. There’s lots of stairs to get down to the hotel from the main road. If you have anything that limits you from walking the stairs I wouldn’t recommend this property. I would also recommend setting up transfer to and from hotel as location is hard to find. The rooms were just like the pictures online. Lovely rooms, pool , and phenomenal view! Breakfast was very nice. Staff was very helpful and attentive. * the Breakfast Served is ok. * the rooms look nice, although the balcony was super tiny... and again the view not that great. Everything was very nice and very clean. I loved the rain shower nozzle in the shower. The reception staff can help you plan anything you like, including taxis to and from the airport and ferries. They held our bags, even after check-out, so we could sightsee some more before heading to the ferry. We loved the view. The breakfast buffet had a nice selection and variety. Staff was friendly and helpful. The hotel was gorgeous. Pool-wonderful. Location-wow! View-wow! Beautiful decor. It was a beautiful room with an even more beautiful view. Best place to watch the sunset! Great location! Close to many restaurants and had a spectacular view of the sunset every night. Lock in a great price for Oia Mare Villas – rated 9 by recent guests! 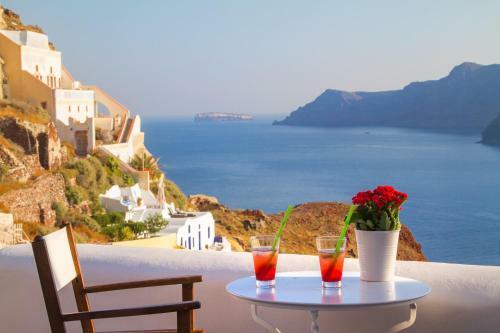 One of our top picks in Oia.Perched on Caldera Cliff and in the center of the traditional Oia Village, the Oia Mare Villas overlooks the Aegean Sea, the Caldera and Thirasia Island. From the property's swimming pool, guests can gaze at the sea and enjoy the magnificent sunset views. Oia Mare Villas has cave-style rooms and suites with air conditioning, free Wi-Fi access and a private balcony or terrace overlooking the sea. Each white-washed unit remains true to the style of the island, featuring minimal decoration, built-in beds and handmade furnishings.The bathrooms include built-in showers, free toiletries and hairdryer. Some units have an outdoor hot tub. Guests staying at Oia Mare can easily explore the village of Oia and visit its local tavernas and restaurants just a few steps down the cliff. The traditional fish tavernas of Ammoudi are within walking distance. With spectacular views of the Caldera and Aegean Sea, this charming hotel is in a secluded location from Oia’s tourist areas, just a 10-minute walk from beautiful Ammoudi Bay. When would you like to stay at Oia Mare Villas? Enjoying Caldera and Aegean Sea views from its private terrace, this Cycladic-style studio has a flat-screen satellite TV, mini fridge,safe box and kettle. The bathroom is stocked with a shower, while free toiletries are also offered. Air conditioning comes standard. Offering a private balcony with views of the famous sunset, the Caldera and the Aegean, this Cycladic-style studio has a flat-screen satellite TV, mini fridge , safe box and kettle. The private bathroom comes with shower and includes slippers ,free toiletries and pool towels. Air conditioning comes standard. 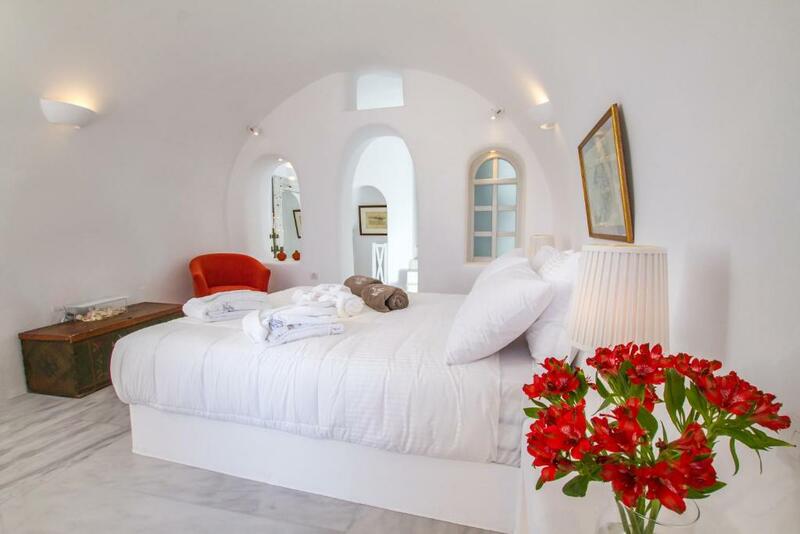 Enjoying Caldera and Aegean Sea views from its private terrace, this Cycladic-style cave suite has a flat-screen satellite TV, mini fridge,safe box and kettle. The private bathroom is stocked with a shower, while free toiletries are also offered. Air conditioning comes standard. 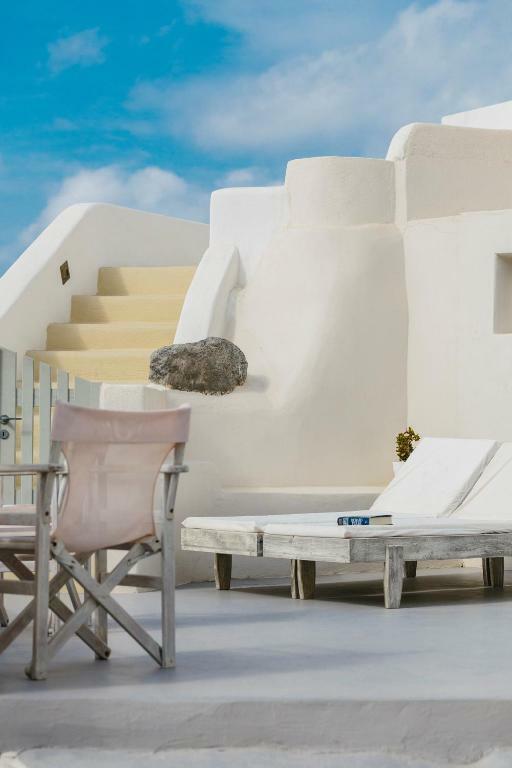 Offering a private balcony with Aegean Sea and Caldera views, this traditional Cycladic-style, 2-bedroom suite features whitewashed walls and built-in beds. It includes a dining area and a spacious seating area with flat-screen, satellite TV, mini fridge,safe box , kettle,hairdryer,slippers and pool towels. Please note that this room type is fitted either with 1 double, 2 single beds and a sofa bed, or 2 double beds and a sofa bed. Opening to a private balcony with Aegean Sea and Caldera views, this Cycladic-style suite has a spacious seating and dining area. A sofa bed is included in the room. A flat-screen, satellite TV, mini fridge,safe box , kettle,hairdryer,slippers, pool towels and shower amenities are included free of charge. Air conditioning comes standard. Featuring Aegean Sea views, this room comes with one bedroom with a double bed and a small sitting area with mini fridge and kettle. The bathroom is stocked with a shower, while free toiletries are also offered. Featuring an outdoor refreshing hot tub, this spacious and tastefully decorated suite enjoys Caldera and Aegean Sea views from its terrace. The private bathroom includes bathrobe, slippers and free toiletries. Flat Screen TV with satellite channels, safe box and pool towels are also included. Air conditioning comes standard. 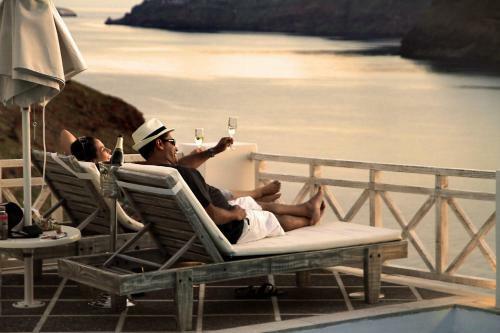 Featuring an outdoor hot tub, this Cycladic-style decorated suite offers Caldera and Aegean Sea views from its balcony. Bathrobes, slippers and free toiletries are provided. Flat Screen TV with satellite channels, safe box and pool towels are also included. Air conditioning comes standard. Featuring an outdoor hot tub, this Cycladic-style decorated suite offers Caldera and Aegean Sea views from its balcony. Bathrobes, slippers and free toiletries are provided . Flat Screen TV with satellite channels, safe box and pool towels are also included. Air conditioning comes standard. House Rules Oia Mare Villas takes special requests – add in the next step! Any additional adults are charged EUR 80 per night for extra beds. Oia Mare Villas accepts these cards and reserves the right to temporarily hold an amount prior to arrival. Please inform Oia Mare Villas of your expected arrival time in advance. You can use the Special Requests box when booking, or contact the property directly using the contact details in your confirmation. Slow check in process + we waited long time for the transport from the port. Also they need to work on and update the breakfast menu. We booked a standard room with caldera view but got upgraded to a suite for a 5 night stay in Oia. We took the free airport to hotel shuttle, which the hotel provided, and it took approximately half an hour to get to our destination. There was a bit of a walk, which was beautiful and we don't mind. Margarita, the receptionist greeted us with a warm welcome, provided alot of helpful information and answered our questions during our stay; check-in was fast and easy. Staff were nice and friendly and always greeted us with smiles. The hotel is located along the way to Amoudi Bay, so there were a lot of stairs towards and from the hotel itself - not recommended for people with knee problems, but other than that everything else is perfect. The view is breathtaking from any part of the hotel which is a plus plus. Breakfast was delicious too! Thank you Oia Mare Villa, the service was amazing and we had such a wonderful time. This booking is done from tarve agent , and they did not accept it. We did experience a power outage and a WiFi outage. These villas were nothing short of amazing. The views were spectacular, the staff was amazing, and the room itself was very cozy. The view of Caldera and sunset is breath taking. The property location and facilities is a treat. 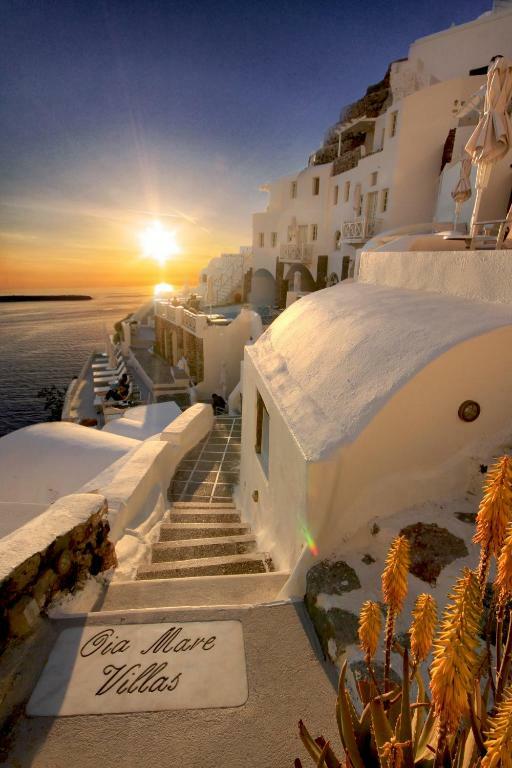 Oia Mare villas - heaven on earth - literally! The hotel is located on the quieter side of the caldera, which we loved as it was away from the busy pedestrian street. You also get a direct view of the sunset right from your patio = bonus! We loved everything else about Oia Mare, from the rustic but upscale interior decor of the room to the amazing breakfast selection and welcoming/friendly staff. If this is your first time in Santorini and you’d like to stay cliffside, Oia Mare is where you want to be! Too far down the bottom of Oia; around 300 steps and it makes it tiring to go up and down. The location is fantastic and we were able to watch beautiful sunsets from our own balcony. It’s also well located to explore Oia, and has spacious and very comfortable rooms. Highly recommend. Access to the hotel was a tedious walk. 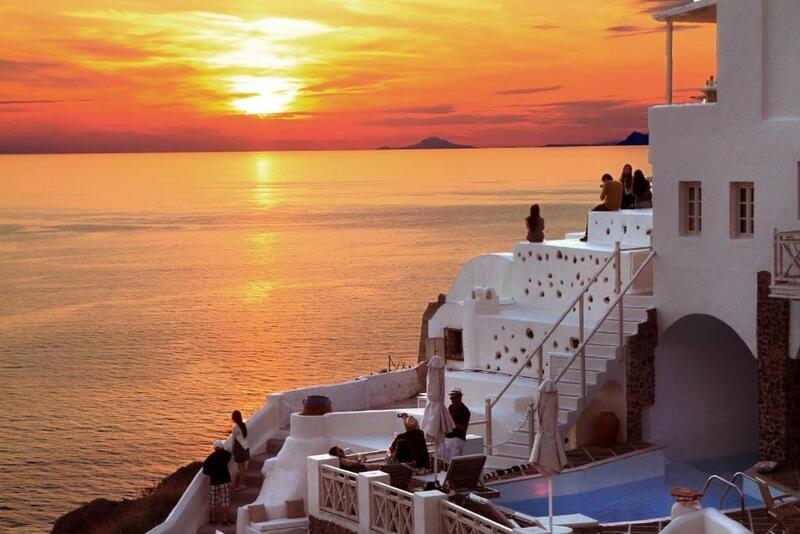 The location is perfect for watching beach sunset in Oia. And the staff are amazingly friendly. They have free shuttle bus services from airport/port too. Everything! The views were amazing, the villa was incredible, the suspended bed was fantastic!